Programming was my first love, and it will be my last. I gave a short talk on YouDebug at the Mannheim Java User Group (Majug). YouDebug is a Java debugger developed by Kohsuke Kawaguchi, which can be scripted in Groovy. The slides are available under the CreativeCommons license BY-NC-SA. Lars Vogel gave a talk on Google AppEngine at the Mannheim Java User Group (Majug). 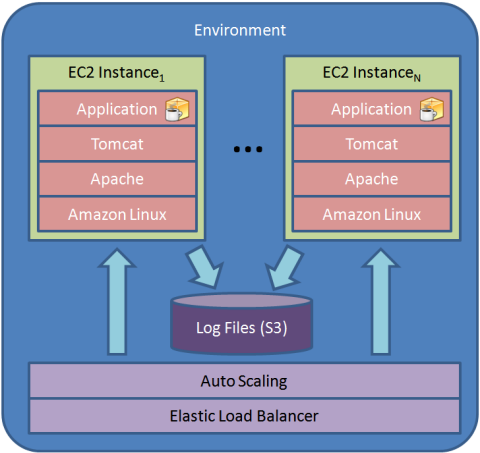 The default Amazon Elastic Beanstalk AMI provides a Java-based application container with Apache Tomcat as the work horse. All you have to do is to deploy a standard Java WAR file containing your web application. But sometimes, the standard AMI does not provide everything. Maybe the Apache configuration needs to be tweaked or some package, e.g. a local memcached server, is missing. Customizing the Beanstalk AMI is easy, there are only a few simple steps, which are outlined here. First of all, start the AMI to be customized in the AWS console. Note: as described by foremosttravel in the Beanstalk forum, the instance should be started from the EC2 console, NOT the Beanstalk console, as running the AMI within the Beanstalk environment may lead to it being terminated during the EBS snapshot, as it might fail to answer to the Beanstalk health checks. Copy the SSH command line, adjust the path to your private key and connect to the instance using a SSH client. Note: you need to connect as user ec2-user, root access can be obtained using the command sudo su -. See this blog post for details on how to access the instance. Now we are free to customize the AMI’s files to our heart’s content. Note: As the AMI is running outside the Beanstalk environment, Apache, Tomcat, and HostManager (the software interface to Beanstalk), are not running, as they didn’t get the expected parameters, such as the path of the application to start. This doesn’t matter, as soon as we start the customized AMI in an Beanstalk environment, everything works again. Note: when changing HostManager or the Apache configuration, please make sure, that HostManager still answers to Beanstalk requests on /_hostmanager and the application to health checks on /, otherwise the instance will be terminated and another will be started! Now that we are done, we need to create an EBS snapshot to preserve our customizations. The AMI is EBS-backed, so a snapshot can be used to register an AMI, which is based on the snapshot. Create an EBS snapshot, either from the EC2 console or the command line tools. See the user guide for details. You now have an AMI. See Images > AMI on the left side of the EC2 console and choose Owned By Me in the AMI tab to view your newly create AMI. Note down the AMI id. If you want to make some more changes, keep the current instance running, while you test your changes from within Beanstalk. After a test drive (see below), make some more changes and create another image. Rinse and repeat until you are satisfied with the results. Don’t forget to clean up any unnecessary EBS snapshots and AMIs, as they cost actual money! If you want to test-drive your customized AMI, you need to start an Beanstalk environment with the id of the customized AMI. There are two ways to perform this, via the Beanstalk console or from the command line. We use my simplified script to start an Amazon Elastic Beanstalk application from command line. See here for a detailed description. We can specify all parameters right from the start, so we do not need to wait for the initial start, before we can adjust the configuration. Have fun creating customized instances. Please leave feedback and/or a note in the comments, which describes your changes. I will try to change HostManager to run the Virgo OSGi server instead of Tomcat, so stay tuned for the next installment. After playing around with Amazon Elastic Beanstalk, I started to explore the command line tools. Starting an Amazon Elastic Beanstalk application from the AWS console is easy and reasonably fast. The main problem is that you can’t currently provide additional settings such as the instance type (e.g. m1.small or t1.micro), a SSH key or application parameters. After starting the application environment, it must be stopped again, before the configuration can be changed. This costs an instance hour but, more importantly, this procedure takes quite a while, as AWS must reconfigure the load balancer, auto-scaling group, start your instance(s), etc. All you need is to install the Elastic Beanstalk command line tools and my script. Elastic Beanstalk provides many parameters, which can be set. A full list can be obtained using elastic-beanstalk-describe-configuration-settings, also from the command line tools (NOTE: fix required!). The long version in JSON format is available here. Starting an application environment is easy and the command line tools help a lot. There are still some bugs, but I’m sure, the Beanstalk team will address them soon. The forum is a great resource. My next post will be about creating a customized Beanstalk AMI. Stay tuned! Amazon Elastic Beanstalk provides a PaaS similar to Google AppEngine, bundling many of their existing offerings such as Elastic Compute Cloud (EC2), Simple Storage Service (S3), Simple Notification Service (SNS), Elastic Load Balancing, Auto Scaling, and monitoring using Cloud Watch into a simple to use service. Additionally, other Amazon services such as SimpleDB, Relational Database Service (RDS), Simple Queue Service (SQS) may be used as well. Currently, Elastic Beanstalk provides a Java-based application container with Apache Tomcat as the work horse. All you have to do is to deploy a standard Java WAR file containing your web application. Simply create a Java web application with Spring MVC, Grails, OSGi, Eclipse RAP, or any other of the numerous Java web frameworks and upload it using the AWS web console. Additional containers for other platforms such as Ruby, Python or PHP may follow later, but as Tomcat hosts standard Java WAR files, anything with a Java implementation may be run. Ruby apps based on Rails or Rack using Warbler and JRuby, Python apps using Jython, even PHP apps can be made to run on Beanstalk. In this blog post, I’ll dive into the inner workings of a Beanstalk server instance and poke around its internals. I invite you to come along for the ride. 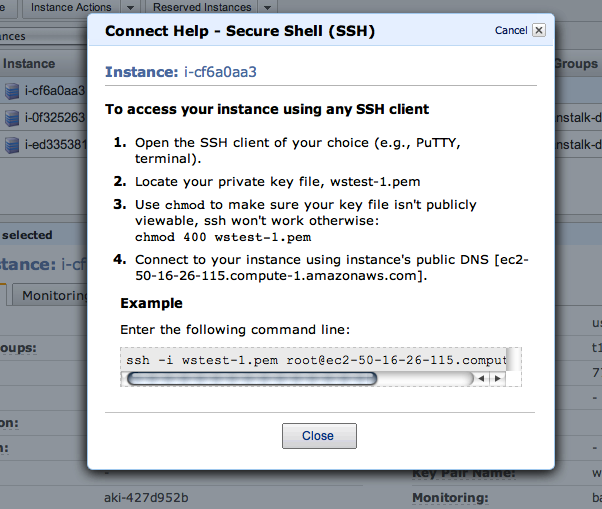 The first step in dissecting a Beanstalk instance is getting access via SSH. 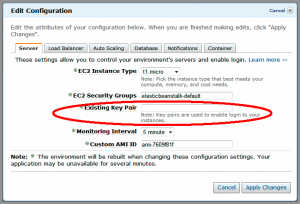 Enter the name of a key pair as configured in your EC2 web console. 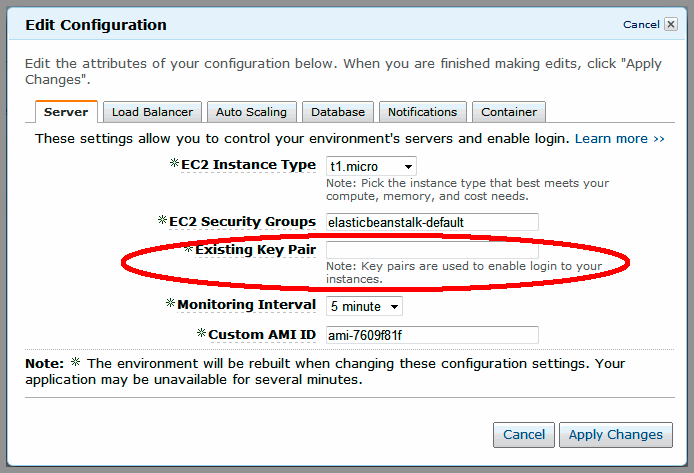 See the EC2 guide and the description in the Elastic Beanstalk guide for details on creating and configuring a key pair. Setting the key pair requires a restart of your Beanstalk environment, which may take a couple of minutes. The first steps are to collect some interessting facts. The instance uses a Amazon Linux AMI (release 2010.11.1 (beta), README). The AMI id for the ElasticBeanstalk-Tomcat6-32bit is ami-7609f81f, the kernel id is aki-407d9529. The instance is EBS-based and there is no ephemeral storage. Currently, Beanstalk is only available in the US East zone. The process list reveals: along with Apache Tomcat, Beanstalk uses the venerable Apache Web Server. Additional software includes Bluepill for basic process monitoring, and Amazons own HostManager (see below), which is run within a Thin web server. Elastic Beanstalk scales EC2 instances as needed. Therefore the first target is a load balancer provided by Elastic Load Balancing. Each instance runs Apache as the front end on port 80, with web request being reverse proxied into Tomcat on port 8080. Requests for URI /_hostmanager are forwarded to HostManager on port 8999. 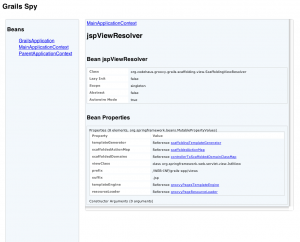 CloudWatch performs health checks by periodically requesting the root page (URI /) of your application. Both health check URI and frequency are configurable. If an instance is no longer available or the load changes, CloudWatch starts or stops instances. Local instance management is performed by Amazons HostManager. HostManager is a Ruby application based on Rack and running in a Thin server on port 8999. It receives requests on URI /_hostmanager. 72.21.217.96 (72.21.217.96) - - [21/Jan/2011:22:00:45 +0000] "POST /_hostmanager/tasks HTTP/1.1" 200 368 "-" "AWS ElasticBeanstalk Health Check/1.0"
10.223.61.43 (10.223.61.43) - - [21/Jan/2011:22:01:05 +0000] "GET /_hostmanager/healthcheck HTTP/1.1" 200 90 "-" "ELB-HealthChecker/1.0"
10.122.19.154 (10.122.19.154) - - [21/Jan/2011:22:01:11 +0000] "GET /_hostmanager/healthcheck HTTP/1.1" 200 90 "-" "ELB-HealthChecker/1.0"
10.223.61.43 (10.223.61.43) - - [21/Jan/2011:22:01:36 +0000] "GET /_hostmanager/healthcheck HTTP/1.1" 200 90 "-" "ELB-HealthChecker/1.0"
10.122.19.154 (10.122.19.154) - - [21/Jan/2011:22:01:42 +0000] "GET /_hostmanager/healthcheck HTTP/1.1" 200 90 "-" "ELB-HealthChecker/1.0"
72.21.217.96 (72.21.217.96) - - [21/Jan/2011:22:01:46 +0000] "POST /_hostmanager/tasks HTTP/1.1" 200 368 "-" "AWS ElasticBeanstalk Health Check/1.0"
10.223.61.43 (10.223.61.43) - - [21/Jan/2011:22:02:07 +0000] "GET /_hostmanager/healthcheck HTTP/1.1" 200 90 "-" "ELB-HealthChecker/1.0"
10.122.19.154 (10.122.19.154) - - [21/Jan/2011:22:02:13 +0000] "GET /_hostmanager/healthcheck HTTP/1.1" 200 90 "-" "ELB-HealthChecker/1.0"
10.223.61.43 (10.223.61.43) - - [21/Jan/2011:22:02:38 +0000] "GET /_hostmanager/healthcheck HTTP/1.1" 200 90 "-" "ELB-HealthChecker/1.0"
10.122.19.154 (10.122.19.154) - - [21/Jan/2011:22:02:44 +0000] "GET /_hostmanager/healthcheck HTTP/1.1" 200 90 "-" "ELB-HealthChecker/1.0"
72.21.217.96 (72.21.217.96) - - [21/Jan/2011:22:02:47 +0000] "POST /_hostmanager/tasks HTTP/1.1" 200 368 "-" "AWS ElasticBeanstalk Health Check/1.0"
HostManager is installed in /opt/elasticbeanstalk/srv/hostmanager. A file list can be found here. /opt/elasticbeanstalk/lib also contains a full Ruby 1.9.1 installation. That’s all for today’s blog post. Further posts will take a closer look at HostManager and deployment including the application setup sequence. I’m looking forward to any feedback and additional information. Maybe we can even hack HostManager to accept other application containers, e.g. for OSGi applications. Programming for and in an OSGi environment is sometimes hard. Getting started is hard as well. groovyx.osgi helps both setting up an OSGi environment and simplifies programming by providing support for easy access to OSGi services, etc. Setting up an OSGi environment is hard work: you have to download an OSGi implementation (usually Apache Felix or Eclipse Equinox, but there are others as well). Then there are many dependencies to download. There is an excellent tool, which simplifies the startup part: Pax Runner. Pax Runner can resolve dependencies from URLs or Maven repositories and start the OSGi framework. One problem remains: you need to download Pax Runner and the configuration is a (set of) static text file(s). To simplify things and allow scripting in the “recipes”, the module groovyx.osgi.runtime (README) provides a nice Groovy DSL for creating and starting an OSGi framework. The dependency resolution code is derived from Grails and was written by Graeme Rocher. A more complete example including automatic download of dependencies can be found here. Another example provisions an entire OSGi environment including Apache Felix WebConsole on port 8081. The OSGi programming model is based on services (or micro-services, as Peter Kriens likes to call them), which are accessed via the BundleContext. Services are dynamic, they can come and go any time during the lifetime of an OSGi application. This is both a strength, as an application can be extended or updated without application shutdown, and a weakness, as it requires careful handling of service dynamics. The groovyx.osgi module (README) contains helper classes to make OSGi programming easier. This package was inspired by ScalaModules. The filter support is derived from the filter4osgi project and was contributed by Hamlet D’Arcy. An overview on basic usage of Groovy with OSGi can be found at the Groovy Homepage. groovyx.osgi and groovyx.osgi.runtime are released under the Apache 2.0 license. The code is available at GitHub. You can either download groovyx.osgi and groovyx.osgi.runtime 0.1 from GitHub or install it using Grape, Ivy, or Maven from the Maven repository at https://github.com/jetztgradnet/repository/raw/master. This script is executable with nothing but Groovy (>= 1.7.5) installed. OSGi provides no silver bullet for modularization, but it greatly helps, once you wrapped your head around bundles, services and dependencies. It’s not always an easy road, but there are many helpful tools and people out there. I hope, groovyx.osgi can help you to create great applications. Have fun playing in your OSGi sandbox and don’t forget to send me your thoughts. Any feedback is greatly appreciated, either in the comments or open a issue at GitHub. I just released a small update for the OSGi plugin, which fixes dependency resolution for Spring DM. Thanks to lemnitram and Klaus Baumecker for reporting it. Spring DM 2.0 is currently only available as snapshot release (2.0.0.M1). The jars used to be available from other repositories (e.g. SpringSource Enterprise Bundle Repository (EBR)), but they have vanished, so I needed to add the Spring Milestone Repository. For installation and usage of the plugin see me previous blog post and the docs. Spring DM has been donated to the Eclipse Foundation by SpringSource, where it will be part of the Gemini Blueprint and Gemini Web projects. This means, that Spring DM 2.0 will never be released, so the OSGi Plugin needs to be ported to use Gemini Blueprint and Gemini Web instead. This will happen in the 0.3 release. I just released version 0.2 of my OSGi plugin for Grails. The OSGi plugin is released under the Apache License 2.0. The Grails OSGi plugin adds support to package and run a Grails application as an OSGi bundle. The bundle(s) may be run in an ad hoc assembled OSGi container or deployed to an external OSGi app server such as SpringSource DM Server, Eclipse Virgo, or Apache Karaf. See my blog series for earlier thoughts and information for running a Grails application in an OSGi environment as well as concepts of and basic information on OSGi. This post and the following installments of the series will show how to use the plugin and present some examples. Simply call grails install-plugin osgi to install the OSGi plugin. The application can be accessed at http://localhost:8080/myapp-0.1/. Note: if the bundle exists, it won’t be re-created automatically after changes. So for now use parameter -forceBundle after changing something in the Grails app: grails run-bundle -forceBundle. The bundle context is the primary interface to the OSGi framework. It can be used to find and register services and interact the environment. The bundle context is available from Grails’ parent ApplicationContext as bean bundleContext. It can be injected into all Spring-managed beans, i.e. all Grails artifacts, like Controllers, Services, etc. In order to get a reference to the BundleContext, an artifact needs to define a reference with the name bundleContext. flash.message = "bundleContext NOT available"
In order to be a valid OSGi bundle, the application is war’ed and provided with the necessary bundle manifest headers (see scripts/_Events.groovy for details). The bundle can be created using grails bundle. The OSGi runtime is assembled in the target/osgi directory and uses the Eclipse Equinox OSGi framework, Spring DM. In the current version, most libraries from WEB-INF/lib are replaced by equivalent OSGi bundles from the SpringSource Enterprise Bundle Repository (EBR). Only Hibernate and Grails libs retain in the bundle. Grails jars already are OSGi bundles, but they cannot currently be installed cleanly in a OSGi container, as they contain circular dependencies and some other dependencies can not be satisfied (e.g. the Radeox library used by the Grails Wiki is no longer maintained, but it shouldn’t be referenced from the Grails runtime anyway…). There are bundles for Hibernate but due to a bug (possibly in Equinox), Hibernate Cache can not be resolved by the Spring ORM module (see “SPR-7003”:https://issues.springsource.org/browse/SPR-7003 for a description of this problem). The parent ApplicationContext has been replaced in web.xml by an OSGi-aware variant: OsgiBundleXmlWebApplicationContext. It knows how to export and import OSGi services as/from Spring beans through Spring XML files. These features are currently hidden, but they will be exposed in the next version of the OSGi plugin and made easier through the BeanBuilder DSL and the OSGi namespace. The “Felix Web Management Console”:http://felix.apache.org/site/apache-felix-web-console.html provides excellent insight into the inner workings. It can be accessed at http://localhost:8081/system/console/ with user “admin” and password “admin” (Note: the web console runs on a different port!). The command grails run-bundle drops the user in the Equinox Shell (press RETURN if you don’t see the osgi> prompt). Running grails run-bundle -remoteConsole [port] opens a console with telnet access on the specified port or on port 8023, if omitted. Only a single user can use the console at any time. I just released version 0.2 of my Grails Spy plugin. 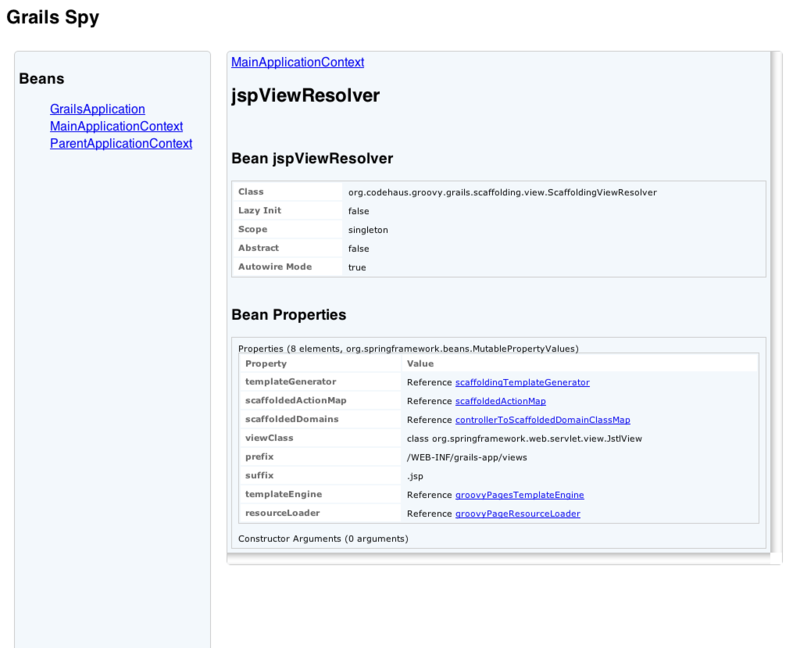 The Grails Spy plugin provides some views to inspect Grails internals such as the Spring application context(s), artefacts, etc. As most of the beans of the Grails WebApplicationContext are constructed at runtime with the help of a BeanBuilder, there is no Spring xml file with bean definitions. In order to browse the dynamic bean definitions, Grails Spy can be used to watch into an application’s guts. Simply install the plugin, enable the Spy controller for the dev environment and run grails run-app. Then browse to http://localhost:8080/yourapp/spy and enjoy. The Spy plugin is released under the Apache License 2.0. The source code is hosted at GitHub, issues can be reported here. My Grails Spy plugin was mentioned in the episode 103 (at 0:18:30) of Grails Podcast. Thanks, Glen and Sven!